The deal reached after all-night negotiations in the Belarussian capital Minsk included a ceasefire that would come into effect on 15 February, followed by the withdrawal of heavy weapons. The Kremlin website published the text of the agreement in Russian. 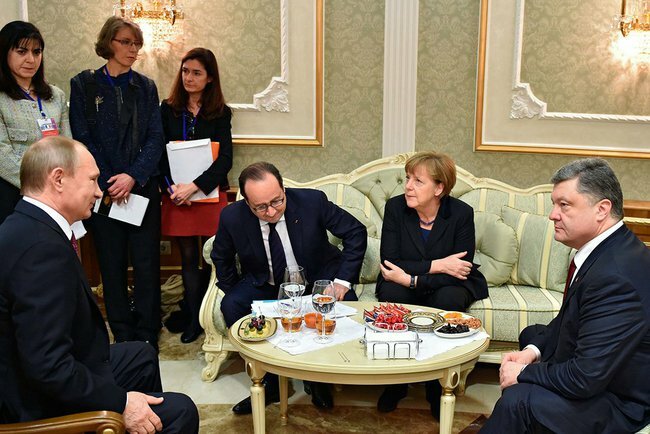 The Minsk summit agreement offered hope for eastern Ukraine, German Chancellor Angela Merkel’s spokesman said. “After 17 hours, negotiations in Minsk have finished: ceasefire from 15 February at zero hours, then withdrawal of heavy weapons. Therein lies hope,” Merkel’s spokesman Steffen Seibert said on Twitter. “We have managed to agree on the main issues,” Russian President Vladimir Putin said. In a press conference the transcript of which was published on the Kremlin website, Putin says that one of the outstanding issues is that the “representatives of the Donetsk and Lugansk peoples’ republics” say their forces have encircled 6.000 to 8.000 Ukrainian troops, and that they expect them to surrender without violence. The four leaders had committed to respect Ukraine’s sovereignty and territorial integrity, according to a joint declaration distributed by the Kremlin. “The main thing which has been achieved is that from Saturday into Sunday there should be declared without any conditions at all, a general ceasefire,” Ukrainian President Petro Poroshenko told journalists. French President François Hollande said there was still much work to be done on the Ukraine crisis, but the agreement was a real chance to ameliorate the situation. He said pro-Russian separatists, who had at one point appeared to reject the deal, had signed up to it. Merkel and Hollande joined Poroshenko and Putin for a marathon negotiating session that began early on Wednesday evening and continued into Thursday morning. The summit discussions came as pro-Moscow separatists tightened the pressure on Kyiv by launching some of the war’s worst fighting on Wednesday, killing 19 Ukrainian soldiers in assaults near the railway town of Debaltseve. As the fighting escalated, Washington has begun openly talking of arming Ukraine to defend itself from “Russian aggression”, raising the prospect of a proxy war in the heart of Europe between Cold War foes. The outcome of the Minsk talks is expected to influence discussions at an EU summit in Brussels on Thursday, when sanctions against Moscow will be on the agenda. A deal would likely mean a softer line towards Moscow. Merkel and Hollande were expected to arrive late for the Brussels meeting but would urge the European Union to support the Minsk deal. The talks took place as an International Monetary Fund mission agreed a bailout to save Ukraine from bankruptcy. The Fund provisionally agreed a $17.5 billion facility with Ukraine, part of a $40 billion funding package, IMF managing director Christine Lagarde said [read more]. Kyiv and NATO accuse Russia of supplying separatists with men and weapons. Moscow denies it is involved in fighting for territory Putin calls “New Russia”. As the French and German leaders peace initiative was announced, pro-Russian rebels appeared determined to drive home their advantage ahead of a deal. Armoured columns of Russian-speaking soldiers with no insignia have been advancing for days around Debaltseve, which has seen heavy fighting in recent days. On the Russian side of the border, Moscow has begun military exercises in 12 regions involving more than 30 missile regiments, RIA news agency reported on Thursday, citing a Defence Ministry official. The United States has been openly discussing arming the Ukrainian government, a move that is opposed by European allies who say it would escalate the conflict while falling far short of giving Kyiv the firepower needed to win. President Barack Obama says he has yet to make up his mind on the question of sending weapons. He spoke by phone to Putin on Tuesday, and the White House said he warned the Russian leader that the costs would rise if Moscow kept aiding the separatists. ALDE Group leader, Guy Verhofstadt, said:"The news from Minsk are a sign of fragile hope – which must not be destroyed in the next three days until the ceasefire enters into force.The EU needs to stay focused on the implementation of the plan, in particular on the enforcement of a swift withdrawal of heavy weapons and a monitoring of the Russian-Ukrainian border. We need to stay committed to ensure that the road from Minsk does not become a frozen conflict in Ukraine." Commenting on the agreement the president of the Socialists and Democrats Group in the European Parliament, Gianni Pittella said:"The peace deal reached in Minsk represents probably the only hope we have for a comprehensive and lasting agreement based on respect for Ukrainian territorial integrity and respect for Russian minorities in Ukraine's eastern regions. "Every day of peace in the midst of war, death and violence is a great success. This confirms that the diplomatic way is the only way to reach a solid peace deal. "Now all forces on the ground should stick to this agreement. Should someone breach the ceasefire to boycott the agreement, they will have to face their responsibility in front of the whole world, with unpredictable consequences." Reinhard Bütikofer, Co-Chair of the European Green Party, said: “Experience teaches us that it is not easy to be optimistic, just because an agreement between the warring sides has been signed. It has always taken less time to break agreements and render them empty than to achieve them. Still, we do welcome the new ceasefire agreement for Eastern Ukraine. We hope it will take hold more firmly than former ones. The agreement puts a heavy burden on the Ukrainian government, which is all the more a reason to strengthen European solidarity with the Ukrainian fight for freedom and sovereignty. The ceasefire agreement must be taken as an opportunity to focus more efforts on Ukrainian reforms, on actively pushing back against corruption, bad governance and to help rebuild the Ukrainian economy. This is of even higher strategic importance than the military side of the conflict, and therefore the West must not hesitate investing heavily into this effort. “From the Russian side we expect them to stick to the obligations, which they have accepted under the ceasefire agreement. President Putin is personally responsible for stopping the ongoing aggression against Ukraine. GUE/NGL President Gabi Zimmer has commented on today's Ukraine ceasefire agreement. "The ceasefire now adopted in Ukraine finally brings the escalation of violence of recent months to an end. It is both a unique opportunity and a duty on the parties involved to find a peaceful political solution," she said. "All parties to the agreement must first ensure that heavy weapons are removed from the region and that people are immediately supplied with urgent humanitarian assistance. "All parties have a duty to implement the agreed steps quickly and consistently. The leaders who were involved in the successful negotiations on the agreement in Minsk have a direct responsibility for continuing the peace process; the now adopted supervisory mechanism is an important common step towards this goal." MEP Helmut Scholz, GUE/NGL rapporteur on Ukraine, added: "The war and its accompanying rhetoric of recent months have dominated public discourse - this means important debates on the country's social division, the unbroken power of corrupt oligarchic clans, and people's desire to live autonomously in all regions of the country have been side-lined. For Ukraine there will now hopefully be a window of opportunity to develop cooperative and rational relations with all neighbours. The economic insanity of cutting off traditional economic relations should be stopped quickly." Dnevnik, EURACTIV partner in Bulgaria: ?????????????? ?? ????? : ????????? ? ????????? ???? The timing of the peace deal and the loan seem a highly unlikely coincidence. Ukraine must have made some pretty unpalatable concessions but 17.5/40 bln of sugar will make it easier to swallow. A day or two ago the British foreign secretary was answering questions in parliament. He was asked why we weren’t lending Ukraine the money they needed. The reply was basically that they were too corrupt and there was no system in place to prevent the money simply disappearing. The IMF is truely an amazing organisation that it can fix this in 2 days is it not? I wonder in whose hands this money will finally end up. Given the first act of the current Ukrainian government was to remove Russian as an official language I am concerned that some of those who helped start this war will leave it well rewarded for their inhumanity. ALDE Group leader, Guy Verhofstadt – this shameless double dealer dares to comment on the tragic events taking place in Ukraine! He was one of the instigators months ago making promises to Ukrainians which the EU cannot keep. Verhofstadt has a big mouth and a very small brain which is a dangerous combination. He should be put up for trial at the ICC in The Hague for having been one of those directly responsible for the 6000 deaths so far in Ukraine. That would take the stupid smile off his stupid face – criminal!